In order to be able to use Jazyk, you need to sign up. To sign up, click on the big orange 'Sign up' button on the homepage. Enter your Username in the first field. The name must have at least 5 characters and cannot contain any special characters. If someone has already registered with your username, you will receive the message 'This username is not available.' and you will have to enter a different name. This name is shown across the application and cannot be changed, so choose it carefully. Enter your e-mail address in the second field. A verification mail will be sent to this address. Enter a password in the third field. The password must be at least 6 characters long and must contain both digits and letters. 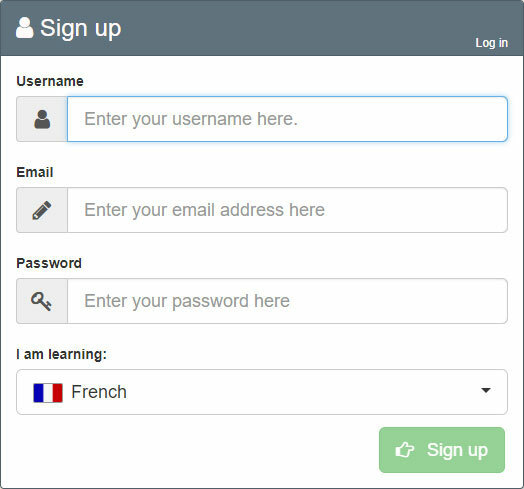 Finally, select the language you want to learn. You can later switch to a different language if you want. Once you have entered valid data in all fields, you will be able to click the green 'Sign up' button. You will be automatically redirected to your (mostly empty) dashboard.